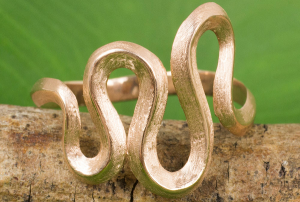 Very delicate, very pretty. 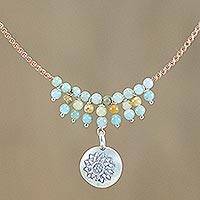 I purchased the "Romantic Whisper Floral Silver and Amazonite Pendant Necklace from Thailand" which has very small, miniature beads (about 1/16 inch in diameter) on an extremely narrow cord. 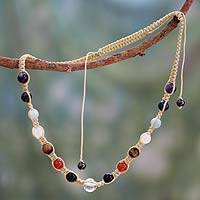 The pendant size listed online represents the length of the entire set of 10 beads positioned over the pendant, while the silver pendant itself is 1/2 inch in diameter. The color of the stones is a wonderful blue, and perfectly matched. 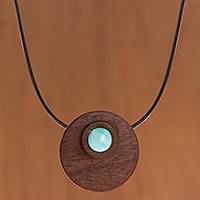 The design is modern, and the workmanship is high quality. A very nice piece. 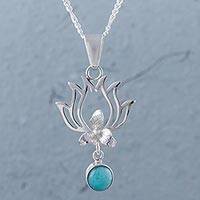 Amazonite and Sterling Silver Pendant Necklace from Peru, "Flaming Drops"
Amazonite and Sterling Silver Waterfall Necklace from Peru, "Queen Beads"
Amazonite Collar Pendant Necklace from Brazil, "Aqua Vicereine"
Different legends tell of the origin of amazonite's name. Called the stone of courage, it is said to be named after the Amazon women warriors of the Bronze Age. Another legend says it is named after the Amazon River. 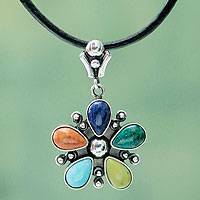 Whatever the name, we're fascinated by the gem's unique beauty. 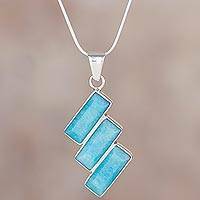 Novica's Amazonite Necklace collection offers a plethora of styles to delight and captivate. 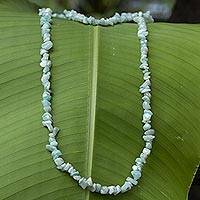 Believed to enhance creative expression, amazonite glows in the breathtaking design of sterling silver necklaces from talented artisans worldwide. 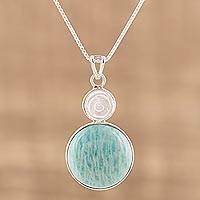 The gem's verdigris green to bluish green makes it a coveted gem in handmade jewelry and gemstone sculptures – always a highly original corporate gift. 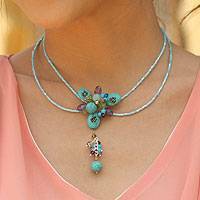 Novica's versatile Amazonite Necklace collection includes beaded necklaces, chokers and pendants featuring a rainbow-full of colorful gemstones.